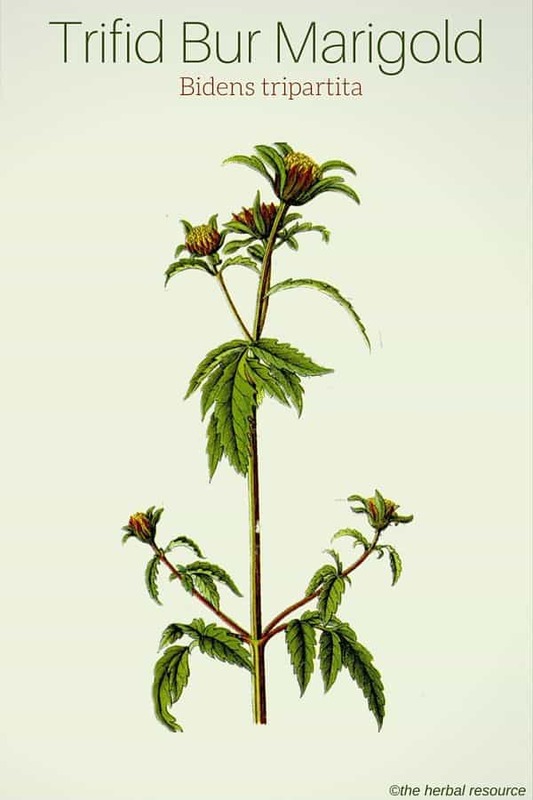 The plant’s genus name Bidens derives from Latin words “bis” meaning two and “dens” meaning teeth, referring to the two reflexed prickles located on the seed coats which allows the seeds to spread by adhering to human clothing or animal fur. The species name Tripartite derives from Latin words “tres (three) and “pars” (parts), referring to the plant’s trifoliate leaves. Bidens tripartita was once known by the name Hipatorium due to the herb’s alleged invigorating effect on the liver. Other Common Names: Bur marigold, water agrimony, tickseed, three-lobe beggar ticks, fliget brøndsel (Danish), Dreiteiliger Zweizahn (German), brunskära (Swedish), flikbrønsle (Norwegian), cáñamo acuático (Spanish), bident tripartite (French), tummarusokki (Finnish). Habitat: Trifid bur marigold is native to most of Europe, North Africa and temperate parts of Asia. It is an introduced species in Australia and New Zealand. The plant grows best in moist, preferably nitrogen-rich soil, and can be commonly found near lakes, swamps, rivers, streams, and ditches. Description: Trifid bur marigold is a member of the daisy family (Asteraceae). 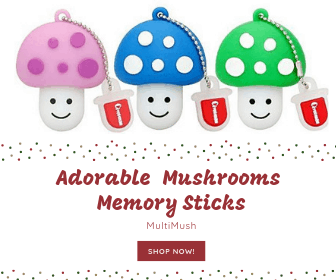 It is an annual plant that can grow to 10-60 cm (4–25 inches) tall with reddish brown or pale green stems and erect short branches and opposite leaves, with the lower leaves clearly large-toothed. The plant can be hairy or almost glabrous, and the size of the plant (especially the leaves) depends largely on the growing location. The leaves are dark green and trifoliate. The flowers are yellow and appear from July to October. The seeds are 5-8 mm long. They are equipped with two (rarely three) reflexed prickles. The seeds usually germinate in 2 – 3 weeks depending on the local temperatures. Plant Parts Used: The aerial parts (mostly the leaves) of the plant are used in herbal medicine. The plant material is collected at the beginning of the flowering period and dried for later use in extracts, herbal teas, and tinctures. Active Ingredients and Substances: Trifid bur marigold contains tannins, some bitter substances, flavonoids (isocoreopsin and isookanin), polyacetylenes, essential oil (containing eugenol and ocimene), coumarins (umbelliferone and scopoletin), polysaccharides, vitamins (tocopherols and vitamin C) and sterols. Today, trifid bur marigold has few applications in herbal medicine, but the herb was once highly regarded, especially during the Middle Ages. The English botanist and astrologer Nicholas Culpeper (1616 – 1654) praised the herb in one of his writings where he wrote that it is helpful as a remedy for dropsy, jaundice, emaciation and other evil conditions afflicting the body. The herb has an astringent, hemostatic and diuretic properties and can be used for various ailments related to the bladder and kidney. The herb contains natural antiseptic substances and may be used internally in tea form as a remedy for inflammation and minor bleeding in the urinary tract that is due to cystitis, gout, gravel or kidney stones and bleeding in the digestive tract due to ulcers, diarrhea, and ulcerative colitis. It has also been used as a relief for prolonged and heavy menstrual bleeding and as a remedy for the common cold and high fever by inducing sweating. Trifid bur marigold can be used in conjunction with sweet flag (Acorus calamus) or ginger (Zingiber officinale) for ailments related to the digestive tract and in combination with common agrimony (Agrimonia eupatoria) to halt bleeding. To improve the efficiency of the herb as a natural treatment of urinary tract problems, the fluid intake (including the herbal tea) should be at least two liters a day. It has been shown that the polysaccharides present in the herb may have an immunomodulatory effect, and it may also be effective against malaria due to some of the flavonoids. Externally, a hot water extract of the herb can be used as a mouthwash or gargle as a relief for inflammation of the mouth and throat, and as a wash, compresses or poultices as a treatment for eczema, ulcers, and minor skin injuries such as cuts and scrapes. In Russia, the herb has been used as a treatment for hair loss (alopecia), which can be attributed to the effect the flavonoids have on the blood flow in the capillaries. In the past, the dried herb was burned to keep insects at bay and it was also used as a dye plant. When the herb is intended for dyeing it should be collected before it blossoms because if the plant produces seeds it is nearly impossible to remove them from the yarn. The herb can either be used fresh or dried. If alum powder is added, the herb yields reddish yellow to orange color. The color quality is best if the plant and yarn are placed in the water at the same time. As an herbal tea: Add one tablespoon of the dried herb to one cup of boiling water. Allow to steep for 1 hour and then strain. Half a cup 3 to 4 times daily is sometimes recommended. 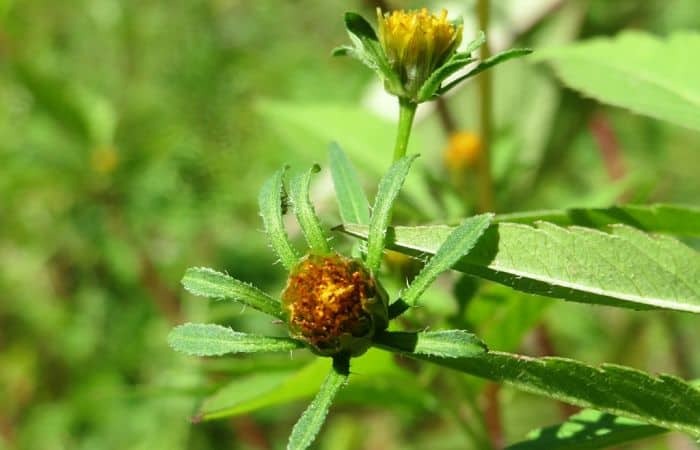 If trifid bur marigold is intended as a treatment for internal bleeding of any sorts if is vital to consult a qualified health care professional prior to use to rule out any serious illnesses. There is some possibility that the plant may cause allergic reactions in people who are hypersensitive to other plants in the daisy family (Asteraceae), such as sunflower or chamomile. Otherwise, there are no reports of contraindications or side effects when the herb is used properly.